Whether you’re cycling to work or riding a bike it’s always a good idea to wear something that makes you more visible. This British designed product comes from TwoZero and it not only does the job very well but it also takes the geek out of Hi-Vis clothing, thanks to it’s smart and functional design. The waterproof TwoZero Cyclone jacket costs £54.99 and is made from lightweight Ripstop material. It has a few smart features, like the integrated rucksack cover which zips open to allow you to wear a rucksack underneath, this not only keeps your backpack dry and clean but also means the cleverly designed reflective material can still be seen whilst wearing it (it’s also available in yellow). The Cyclone also has a loop on the back to allow you to use a TwoZero LED light (with nifty silicone loop for easy attachment) for added visibility and it comes in it’s own foldaway pouch for easy storage. Matching trousers cost £24.99. 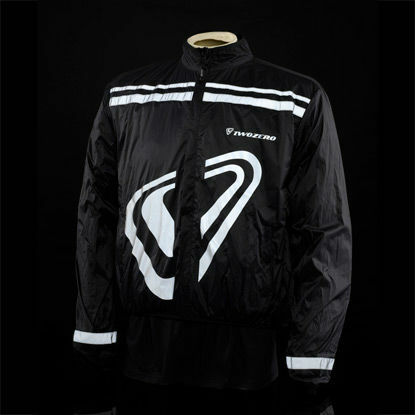 I wear mine for cycling/mountain biking to keep me dry and provide an extra wind and rainproof outer layer, I also use them on the scooter as an easily storable set of trusty waterproofs. Visit www.twozero.co.uk and check out the TwoZero products, they all come well recommended by us.